I have not been so reliable about finishing (or blogging) the Journal pages. 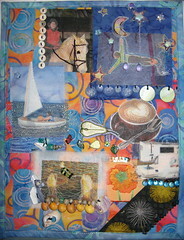 I signed up for a Journal Quilt class at Valley Fabrics. The plan is to make a page for every month. I have finished through June (shown here) but I hated July until I got some suggestions from my cohort in class on Saturday. I am working on August and September both at once right now. August is about being married to Al - it has been 21 years as of August 25, 2007. September is a self portrait on account of it being my birth month. I am torn between some kind of funky sideways view and attempting to recreate a Chuck Close kind of gridded dot thing. And eventually I'll have to go back and fix July. All the done pages are on Flickr. Click this image and you'll be whisked there, almost magically.